Stretchtape’s banding film is designed to stick to itself, not the product it’s wrapping. It allows warehouse users to wrap, stack, and secure pallets with ease and peace of mind knowing they won’t come loose. 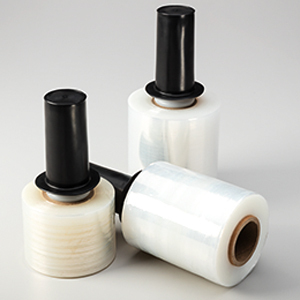 Banding film is ideal for bundling units and helps protect products and packages from damage during transport. Banding film’s elastic memory means it can stretch significantly from its original length. The film tries to return to its original shape and form after wrapping, resulting in a tight, secure wrap. This process ensures bundles will not come undone or need to be rewrapped during transport. 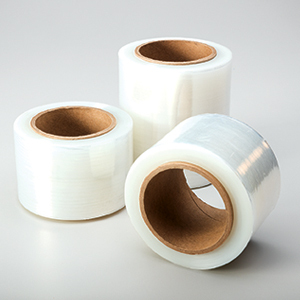 At Stretchtape, we offer a variety of films including linear low-density polyethylene (LLDPE), low-density polyethylene (LDPE), high-density polyethylene (HDPE), vinyl (PVC), and polypropylene (PP). Choose from the most common sizes of banding film available for immediate delivery or customize banding film to various sizes, gauges, and colors as needed. Standard banding film sizes range from 3″ to 5″. However, our technology allows us to provide widths from 1″ to 70″, including fractional measurements. We carry a variety of blown and cast films from 28 gauge to 500 gauge, high strength “equivalent” films, one-sided cling (OSC) films, and pre-stretched films. Specialty banding films are also available for specific industrial uses, such as volatile corrosive and ultraviolet inhibitors (VCIs and UVIs). Our banding film is used in a wide variety of industries, including the apparel, automotive, sports medicine, construction, and healthcare industries. 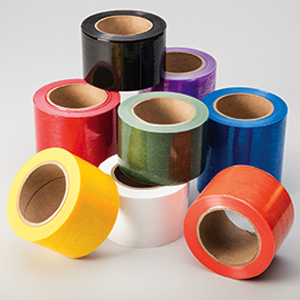 Stretchtape prides itself on delivering highly customizable options for our customers. Stretchtape’s banding film comes in a variety of colors as well as high performance equivalent films. Multiple core I.D.’s available from 1″ to 3″. Custom sizes and gauges are available upon request.